The modern technologies do not just predict our future but create it. They develop with a speed of light and let us have a powerful cinema theater at home. 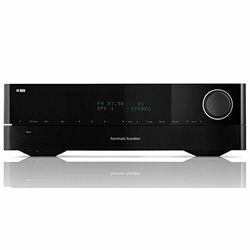 As it comes to making a decision, one begins reflecting – what is the best stereo receiver, and what criteria should I apply for the right choice? There is always a doubt: whether to get a more pricey model and go to the expense or to prune the budget but get a device with less or worse functions. A buyer sometimes forgets that cheaper electronics may contain ALL necessary features without any redundancy, which provide your home theater with overwhelming sound for a little price. 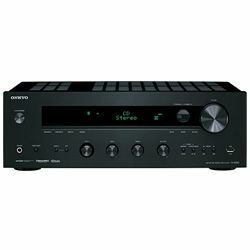 You will definitely learn something new from this article; here you can find some pieces of advice concerning the best average-priced vintage stereo receiver, with a wide selection of functions as for this segment of cost. The budget option doesn't mean a low quality unit, but rather an average device with modest characteristics, which performs its function as well as expensive acoustic systems. Some of the models below are new ones, but you can also find several older models with all the necessary features, which will not become obsolete for some time. The time to make the right decision has come; this article can help you to find an answer what is the best receiver for your sensitive sound perception at an affordable price. 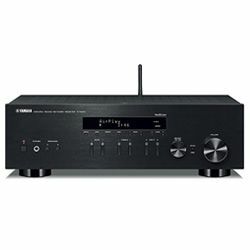 Placing this receiver on the top of our best stereo receivers review has its reasons. It has three connection types: wired, wireless and Wi-Fi Direct. It has all the RCA inputs in case you have a Phonograph, a CD player, and even a tape deck. Instead of buying more CDs, you can stream music off YouTube via your mobile phone through Bluetooth on this receiver. This receiver can connect to the home Wi-Fi, and Wi-Fi Direct creates a network to play your music data. Wi-Fi Direct is useful if the home doesn’t have a network or Internet service. If you have a nostalgia for vinyl recordings, a phono input terminal will come in handy. The remote is effective with buttons arranged conveniently and logically. The stereo separation is great with any system, and there is plenty of volume in reserve. The R-N303 is the perfect blend of technology and timeless design elegance with a number of essential features. Optical audio inputs for TV. Two channels with 100-Watt output. Wi-Fi, Wireless Direct, Bluetooth, and AirPlay, with great performance. The R-N303BL panel display is minimal, in terms of both its content and brightness. The remote has 37 small buttons, none numeric, all labeled with even smaller print. Managing the AM/FM tuners without a tuning knob on the panel, or any numeric controls, creates some hardship. 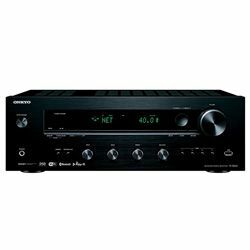 This is a very solid home receiver for a reasonable price. 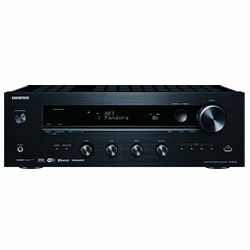 What do you suppose to have in the best home stereo receiver? 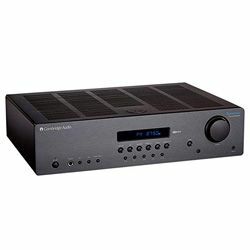 The STR-DH190 has four analog audio inputs and one output, so you can easily connect your traditional audio players like a CD player or a turntable, and recording devices. It also has more than enough power for a mid-sized room. I'm highly pleased with the receiver: FM radio has good sensitivity, and there are numerous external inputs. I like the ability to name these inputs. The remote is very robust and functional, and it’s also easy to use. The Bluetooth features (control, pairing, and sound quality) are first-rate. You can power on the receiver using your compatible mobile device if you wish to activate the feature, which keeps the receiver in standby mode. 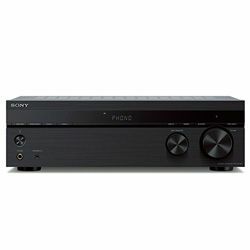 It may not have the same reputation among audiophiles as the previously described model, but Sony deserves a credit for this entry level 2 channel receiver that offers a decent set of features, paired with excellent sound. It has great sound reproduction with excellent clarity. The remote control lets you rename the inputs in order to label and distinguish them. Nice and compact enough to fit on a bookshelf. You can only pair it via Bluetooth to one device at a time, like your computer or your iPhone, not both. The radio tuner scans very slowly to find stations. High current enables masterful control of the speakers for extremely accurate and dynamic sound. The free Onkyo Remote app puts a range of streaming options at your fingertips, from universal hi-res audio via network-attached devices synced with Internet streaming services to music on your smartphone and tablet. This device can do everything a modern setup needs, and it has pleasing sound quality. Phono-related characteristics are exceptional and all the new digital features are easy to set up. 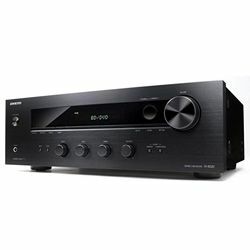 You can pair this potentially best stereo receiver for music with a Bluetooth-compatible device, and enjoy huge cinematic sound. There is a possibility to have full volume control through all devices that are on the same network, it is responsive and makes this device a really decent stereo. It’s very versatile and looks great. No problems connecting to a wireless network. Customize EQ function is inadequate. It is worth noting that you cannot change the line output level, it is just a steady signal. If you buy an amplifier, you do it for a reason. 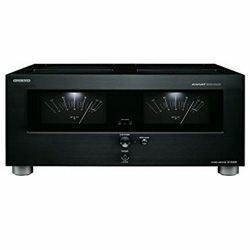 The Marantz MM7025 Stereo Power Amplifier answers many needs for both two-channel devotees and home theater enthusiasts alike. It produces 140 Watts of power per channel with full-bandwidth and very low distortion characteristics, so it can precisely control performance-demanding speakers in large rooms or deliver subtle nuances in smaller acoustic environments. The MM7025’s advanced technology serves all your listening needs. Conservatively rated power adds WAY more to your music or movies than just volume; it's quite impressive! Overall, this sturdy and versatile receiver offers high-quality amplification. 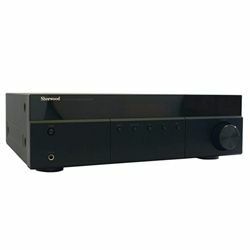 Current feedback circuits, originally developed for the Marantz’s Reference Series amps, ensure the purest sound reproduction regardless of its source. 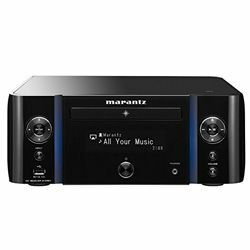 Excellent improvement of sound by this Marantz receiver is essential for any quality surround sound system. 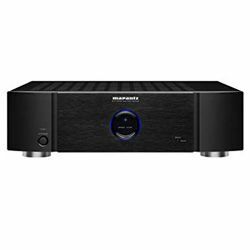 The particular positioning of each instrument in an orchestra is crisp and distinct, the bass is formidable and powerful, that what every audiophile expects from his best 2 channel stereo receiver. It is sturdy and built from excellent quality components. Perfect reproduction of any kind of music. Controls speakers in small and large rooms. The speaker terminals accept banana plugs but are not the standard 3/4 inch pin spacing. There is no switch for the 12-Volt active/standby input. Yamaha offers first class quality at an excellent price. It does everything exceptionally well, from CDs, phono, auxiliary inputs for an iPod, and the best of all, it provides a very good and simple Bluetooth connection. 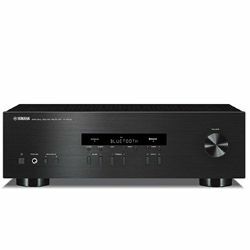 This is possibly the best stereo receiver, as it allows you to manually control your music's balance of high and low frequencies. All things combined, this is a very versatile system that offers excellent performance and great sound quality. 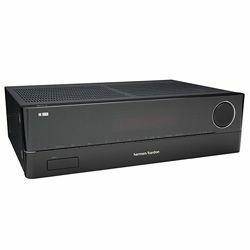 Yamaha R-S202BL is a basic receiver with numerous features that we treasure: 1) Bluetooth; 2) CD channel/connection; 3) three extra audio ports; 4) A full-function remote control. Up to 8 different Bluetooth devices can be linked to this receiver, and, when Bluetooth is selected as the input, it willl automatically connect to whichever one is on. Plugging is a snap and the instructions are super clear. You would like the auto-preset of FM radio stations with a strong signal, and the reception with an aftermarket antenna is excellent. Ability to use the headphone jack and still have audio output to the speakers. It has the option to turn each channel on and off. Separate bass and treble adjustments with the plentiful level of bass. Occasional Bluetooth drop-outs; those make you reset Bluetooth every hour. It is impossible to program cable box remotes to power the unit on and off. You have to turn the volume knob really far to get a good sound level. 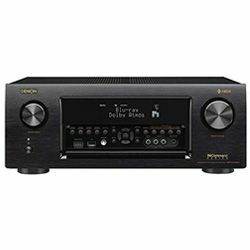 Still have not decided what is the best stereo receiver for you? There is another candidate for this position, and to be brief, Onkyo M-5000R sounds great. The design and finish of this amp are amazing, and in reality It looks better than on pictures. The heavy-duty speaker posts on the back are really nice too. They are able to provide very warm and lush sound without roughness or garbling. If your musical taste runs from acoustic, bluegrass, country rock, jazz, blues, alt-country, country swing, Merle Haggard, George Jones, and some rock, this best vintage stereo receiver created for you. This amp combo handles them all easily, effortlessly, and without distortion. This preamp and power amp combo is superb. The sound is very warm and pure. 80 Watts is the maximum power before the sound weakens. Every inch of the Pioneer SX-10AE was designed to create quality sounds, due to a shorter transmission path, clean grounding, and rigid structure with improved damping. 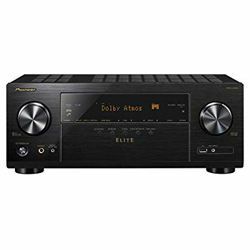 The discrete amplifier inherits the Direct Energy Design of Pioneer’s high-end AV receivers for faithful reproduction of the audio content. The automatic tuning feature lets you easily find stations in your area; however manual tuning is also available. You can save up to 40 stations as the receiver’s presets for quick access. It's a great amp at this price range if you need a high-quality surround sound system. The SX-10AE can automatically turn off after being left uncontrolled for a certain time set by the user. The necessity to raise the volume to 60 before it gets a load. 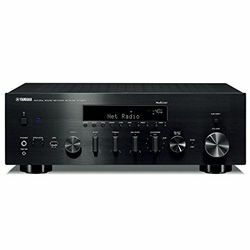 No doubt this is the best high end stereo receiver you can buy for less than $200. You can listen to music through this system at both low and high volume at home/office/man cave. If you consider yourself as someone who likes all types of music, and listens to it a lot, Sherwood can open perfectness for you. It sounds a bit more “open” and “dynamic” and at least as “full” and “clear” as the NAD. Overall, the brushed black metal case will look incomparable at your home. There is no switched outlet on the back: a definite flaw in relation to that phono preamp! Despite the "old school" design of the amplifier, the control is as digital as it gets – you will want to make adjustments via the very functional but not very aesthetic remote. The Bluetooth is magic: effortless pairing, great range, and most importantly, impressive sound. High-quality Bluetooth, with no connection drops. 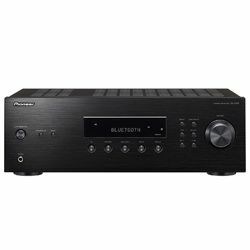 Phono input and Bluetooth are hard to find on the receiver. With low-latency Bluetooth 4.1 wireless technology, you can stream almost any audio that's playing on your smartphone, tablet, laptop, or PC. The “Auto connect” function makes pairing up and playing back your music much faster and easier than before, with enhanced stability reducing loss in audio quality. Crafted for music and film lovers seeking authentic hi-fi sound, the TX-8260 is extensively equipped with inputs to connect a wide range of players. Enjoy room-filling sound reproduction from aforementioned and other sources, such as USB Audio, Network, and Bluetooth. Bass and Treble controls make tuning the sound for various types of music and media as well as various sound levels quick and easy, and ensure a wide adjustment range. In addition to great audio playback, I get good and clear sounding of voices when used for DVD or direct TV connection via an optical cable, which can be an issue with home theatre systems. The bass is solid and not boomy, while the higher frequencies are clear and vibrant. Clear highs without tinny side-tones, comfortable mid sounds, and just enough deep bass. Remote buttons clearly labeled and easy to use. You can bypass the bass and treble controls to play without any adjustments for sound purity. It's difficult to tune in radio stations. AM antenna is somewhat problematic to adjust for best reception. This is a great audio device for a TV set. 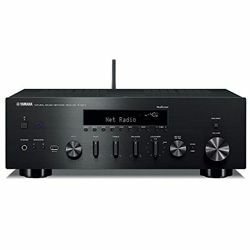 The receiver can stream Internet radio (only if you have an Ethernet connection, as it doesn’t support Wi-Fi) and even has a good-quality Bluetooth connection. I like the modern minimalist style, and HK products certainly fit the bill in that category. The black plastic face reveals an elegant white text, which indicates modes, features, and menus. In addition, there is a large, faintly luminous ring around the volume knob. Excellent bass and midrange tones, a really nice "punch" even with lower volumes - without a doubt, you can tell this is a powerful amp. Easy setup and intuitive controls, if you like a slow and methodical approach. The sound required a bit of initial tweaking using the remote tone control buttons (a bit tricky to access - you need to make sure the remote is set up with the tone control applied to the Stereo mode - but worth the effort). A great number of input options including a phono stage of decent quality. Auxiliary inputs for Phono, Tape, and DVD, and two optical inputs. Can run either of two sets of speakers, or both sets at once. Despite being rated for 125 Watts and I have no doubt it can, in fact, put that out, the quality of the audio is just not up to this units price point. Bluetooth cuts out at random times for a second. There is literally no way to adjust the left/right balance on this amp. This old-fashioned amp/receiver doesn't have a lot of bells and whistles, but it performs its set of functions well. Plug in a good sound source (including a turntable using the built-in preamp), attach a good pair of speakers, and you'll get good quality sound. The amplifier section has a classic AB design with discrete components, lots of heatsink surface area, and a well-ventilated case. All of these qualities are indicators of old-school tank-like design and construction. The actual power output is more than adequate, even with the relatively inefficient sealed-cabinet (air-suspension) speakers driven by this receiver. Medium frequencies are punchy and noise thresholds are virtually non-existent. I believe, it sounds better than more expensive receivers. 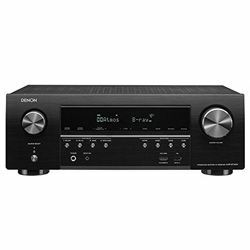 This receiver will fill midsize and larger rooms with realistic sound at appropriate levels assuming the speakers are up to the task. Provides clear and beautiful sound. 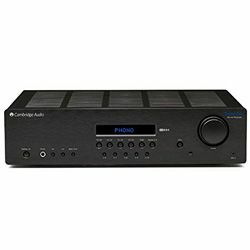 No output for a subwoofer. Doesn't have a "loudness" button for low frequencies and low volumes. 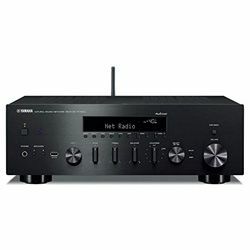 This TX-8020 is a more modern receiver, and its remote also allows adjusting bass and treble. The TX-8020 has a digital readout for a volume level, as opposed to a rotating knob with a painted indicator on the old model. It sounds very fresh and vivid, with good tone controls. Unlike the old model, this one has "direct" control, which cuts out the tone circuitry. This is a good investment for someone looking to power reasonably efficient speakers in a small room. It is intended to provide clean distortionless sound for those caring to listen closely to a musical performance. I like some of the thoughtful design features as the dimmable display, volume buttons offset from all the other buttons on the remote, and a separate "dock" line-level input you can use for whatever you wish. 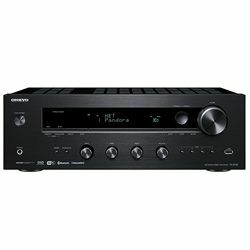 For the money, this receiver is an extremely good deal and sounds great. It has a phono input with ground and a subwoofer pre-out. The receiver is simple to setup and operate. There is no switched AC outlet on the back. The balance control does not completely separate the left/right channels. 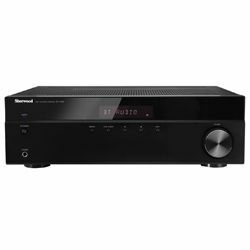 This receiver is more impressive than you can expect from such an affordable unit. It's a basic unit so set up is easy. 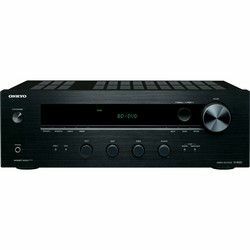 This easy-to-use basic stereo receiver is as good as it gets at this price point. The Sony STRDH130 has plenty of power and delivers very clean sound. There is no loudness control (on/off), but it seems that it is always on. The tuners work very well and have direct frequency input from the remote. The portable input is great for connecting phones. The phone volume still has to be turned all the way up, but it is very close to the level of the FM tuner. The remote controls most of the functionality. The receiver seems to pick up the signal from anywhere. If you're on a budget or just looking for a basic no-frills receiver, then this is it! Controls on the tuner are minimal. Lack of speaker balance control. Below you can find a comparison chart with all necessary features, which you can be interested in. The most important for making the right decision is to conduct a comparison of different characteristics, special features, pros and cons. It is impossible to understand which amplifier is the best if you have not explored brands and models. 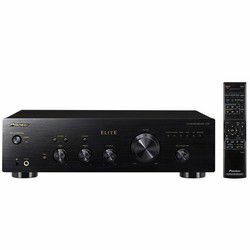 Therefore, the article provides full information, which can help you in the crucial choice of the best stereo receiver for your home theater. Try to compare the technical characteristics of above-described receivers, as, despite their similarity, they still differ from each other in some features.